If you happen to be one of the iOS faithful out there with an iPhone 4 or iPhone 4S and in the market for a case for your iPhone, then perhaps the Griffin Technology Protector case for the iPhone 4/4S might suit your requirements, as the Protector case is part of Griffin’s popular armoured collection that offers superb protection whilst being a very thin case. The Griffin Protector case for the iPhone has been designed from the inside out and manufactured in extra-thick silicone cladding that wraps around your iOS smartphone to protect from your everyday accidents, and safeguards the sides, back and edges against jolts and bumps whilst delivering access to the camera, controls, and dock connector. 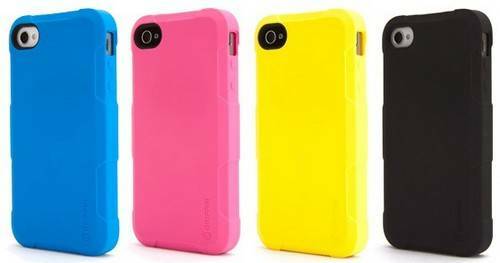 The Griffin Protector case for the iPhone 4 and iPhone 4S features a smooth matte texture to the exterior allowing for easy grip, and has an impact resistant polycarbonate inner shell, whilst being available for the iPhone 4/4s in four colours, black, pink, yellow and blue. The Griffin Protector case for the iPhone 4/4S is available from Amazon UK in pink for Â£10.85, or in black for Â£18.90, or if you prefer you can pick up the Protector case from the Griffin Technology store at a cost of $19.99 each, or you can hit up BhPhotovideo where they are offering the case for $8.07 for the black version, or lastly you can grab the Griffin Protector case in black from Sears at a cost of Â£6.49. So there are a few places where you can purchase the Griffin Protector case for the iPhone 4 and iPhone 4S, will you be purchasing one of these soon?